Lavender Hydrosol is an effective household cleaner. Lavender Hydrosol is a permanent suspension of lavender essential oil within water molecules which can be produced solely during the steam distillation of lavender essential oil. Also known as floral water, lavender hydrosol is an ideal means of bringing the all-natural antiseptic, oil solvent and insect repellent properties of lavender essential oil to a wide range of household cleaning uses. Lavender Hydrosol is effective on glass, mirror, wood, tile, granite, marble, stained concrete, formica, stainless steel, chrome, carpets, rugs, upholstery, leather, etc. There are no additives in our lavender hydrosol. It comes straight out of the still and into the bottle and, as such, it should be used straight, not diluted. Unlike many other mainstream cleaning products, our lavender hydrosol is non-toxic, 100% certified organic and safe to use directly on the skin and even to ingest for both humans and pets. With lavender hydrosol you can clean your house with complete assurance that it is safe for your entire family. 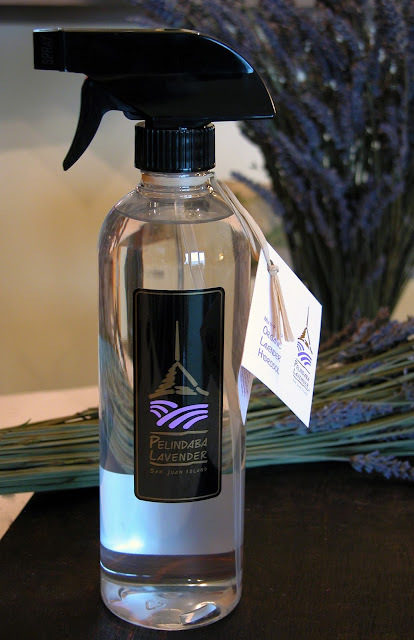 Organic Lavender Hydrosol is a "must have" for non-toxic, natural household cleaning. Read reviews from others to hear how they use it.